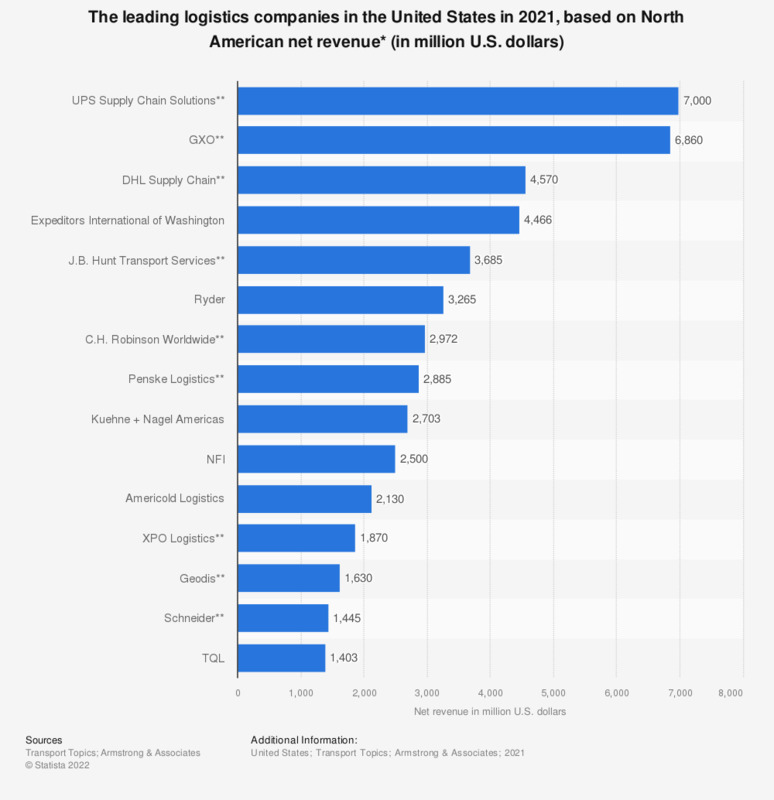 This statistic shows a ranking of the leading logistics companies in 2018, ranked by North American net revenue. In that year, XPO Logistics generated more than 6.1 billion U.S. dollars in net revenue in North America and was ranked first place. Consumers in the United States are benefiting from the multiplicity of transport modes available in our increasingly connected world. The most widely used haulage modes include road and rail transport, as well as ship transport and aviation. Once customers place an order for an item, they trigger a vast array of services going beyond the simple delivery of parcels. Logistics companies offer the integration of information flow through supply chain management software, warehousing, packaging and material handling, as well as forwarding, returned goods management and brokerage. The actual forwarding may be done by using several transport modes across multiple territories. In the 2016 ranking, UPS Supply Chain Solutions was the leading logistics company in the United States. With a customer base including Philips Healthcare, Pratt Whitney and Triumph Motorcycles customers list, the Georgia-based forwarder generated a little over 3.1 billion U.S. dollars in revenue from activities in North America. It is a subsidiary of United Parcel Service, a company that raked in more than 65.8 billion U.S. dollars in revenue in its 2017 fiscal year and employed around 454,000 truckers, pilots, crew members, mechanics, office workers and managers. * Values are based on 12-month 2018 net revenue. ** Figures are estimates. Everything On "Logistics industry in the U.S." in One Document: Edited and Divided into Handy Chapters. Including Detailed References. Statistics on "C. H. Robinson"